Papa K got his start fishing as soon as he could walk and started fly fishing when he was in 8th grade on the Mississippi River outside of Moline, Illinois, where he grew up. If he wasn’t fishing as a kid, he was out playing baseball. He and his wife moved to Evergreen, Colorado, in 1975 and have made their home since. A father of two, Papa K spends most of his spare time chasing around his two grandchildren when he is not guiding fly fishing trips. Having started his guiding career in 2008 after working with Andrew, the owner of The Colorado Angler, to become a certified guide, he joined our team immediately after he was finished with his certifications. 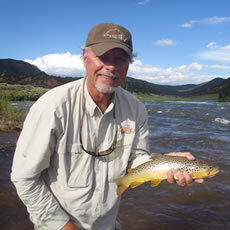 Papa K’s favorite river to guide is the Arkansas due to its natural beauty, crystal clear waters and abundance of fish. He prefers to use a Hopper-Dropper setup on the float from Stone Bridge to Salida East. When Papa K is not out guiding for The Colorado Angler, you will find him spending time with his growing family and building hand-made furniture in his garage woodshop. Having taken his first bone fishing trip recently, he is keen to get back down to the Florida Cayes for more of that style of fishing.